Have you ever thought about expanding your outdoor environment? Where to start and what will you end up with? These are the types of complex issues the design professionals at IVY Studio are trained to deal with, analyze, come up with a set of solutions and implement. Careful listening to what you are trying to accomplish coupled with a detailed set of plans that capture your ideas and aspirations tied to a budget are all hallmarks of our three-stepping stone strategy to planning, designing and implementing the expansion of your dreams. We create a clearly marked path for you with performance standards that are carved in stone. 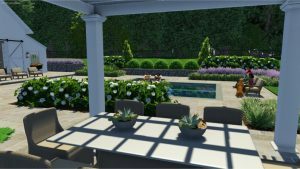 We are IVY Studio, a landscape design and build consulting firm based in the metro Boston region specializing in residential outdoor expansion projects. Contact us at 781-591-0300 or vern@ivystudioMA.com to start the process. You will not be disappointed.